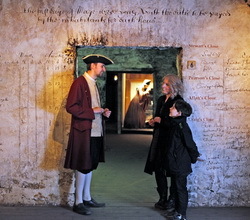 With Edinburgh now rated as the second most popular city for tourism in the UK*, a city visitor attraction is challenging those who think they know Edinburgh to take a step below the surface this summer for a history lesson that can be stranger than fiction at The Real Mary King’s Close! Whether visiting for The Festival or sightseeing and shopping on the world-famous Royal Mile, visitors are just a few steps away from The Real Mary King’s Close, where they can discover a part of the city that has remained hidden and frozen in time since the 17th century. Now opened as an intriguing visitor attraction, complete with guides who take on the persona of one of the former residents of the street, The Real Mary King’s Close experience offers an unforgettable underground tour of one of Edinburgh’s lost streets. Indeed, the guides each offer their own perspective on life in the Close, looking at its history, their neighbours, and some of the legends that have grown up around the location – is the Close really haunted, as many psychics and paranormal investigators believe, and is it true that the street was barricaded when the plague hit Edinburgh, leaving its residents to die in isolation…? “If you are happy to be told the glorious story of the wonderful city of Edinburgh, there are plenty of tours to take and places to visit. But if you want to hear the real story that lies beneath all that glitters, you need to visit The Real Mary King’s Close,” adds Craig. Each tour takes around one hour, and tours depart approximately every 15 minutes.